Potatoes are one of the most satisfying vegetables to grow. And harvesting time is what makes the potato really special, when those delicious tubers are finally lifted up from the soil like buried nuggets of gold. Garden-grown potatoes are really something else! So if you’ve never tried growing them before, make this the year you do. Before you plant you need to decide what type of potato you need. There are two main types of potato: maincrops and earlies. Early varieties are ready from early to midsummer and are further divided into first earlies and second earlies. First early varieties are first to crop, while second earlies follow on a few weeks later. Early potatoes tend to be smaller than maincrop types, but they have arguably the best flavour and often have a smoother, waxier texture that makes them perfect in salads. They’re also sublime when served steaming hot, finished with a drizzle of olive oil and a scattering of herbs. In regions where spring’s arrival is a little slower to arrive it’s worth sprouting or ‘chitting’ your seed potatoes. Do this up to six weeks ahead of planting, to give your crop a head start. Lay them out in a single layer, so the ends with most eyes – that’s the dimples where the shoots will sprout from – face up. Place them into trays or old egg cartons, which hold the potatoes steady. Keep them in a cool, bright place to sprout thick, sturdy shoots. Plant first earlies once the soil has begun to warm up in early spring. Second earlies are planted a few weeks later, while maincrops follow on a couple of weeks later still, in mid-spring. You can use our Garden Planner to check the best times to plant in your area, based on data from your local nearest weather station. The Planner’s also a great resource for browsing variety descriptions and, of course, to lay out potatoes on your plan so you’ll know exactly how many seed potatoes you’ll need to fill the area you have. 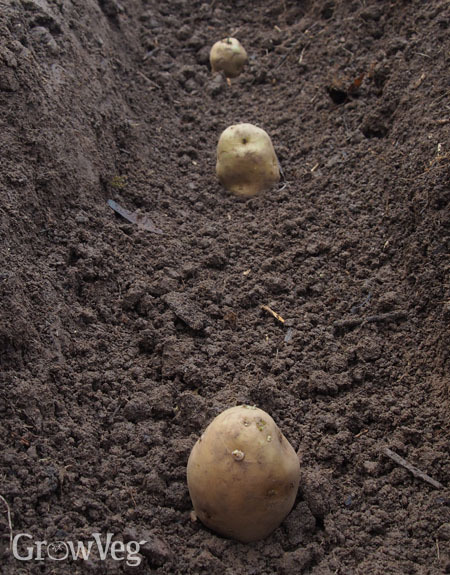 Plant seed potatoes into dug trenches or individual planting holes. Plant your tubers around six inches (15cm) deep, and space them a foot (30cm) apart along the row. Additional rows of early varieties should be spaced at least 18 inches (45cm) apart, while maincrops need a minimum of 30 inches (75cm) left between rows. Shoots should poke above ground within about two to three weeks. They’ll tolerate very light frosts but are best covered over with row cover if something colder is forecast. Once they reach six inches (15cm) tall begin earthing up your potatoes. Earthing up mounds the soil along the row to encourage more tubers to grow and to reduce the risk of light exposure, which turns them green. Use a hoe to draw up the surrounding soil around the shoots, leaving the very tops exposed. Earth up in stages like this each time the foliage reaches a similar height above soil level, and continue till the mounds are either a foot tall or the foliage above has closed over. Remove weeds early on, but fast-growing potatoes soon crowd out any competition. Potatoes need ample moisture for all that growth though. Water thoroughly in dry weather to enable tubers to grow to their full potential, free of any cracks or hollows. You can harvest tubers small as ‘new’ potatoes as soon as the plants begin to flower a couple of months after planting. Continue harvesting early varieties in stages from this point on, leaving the remaining plants to grow on until needed. This staggered approach to harvesting allows you to enjoy potatoes at their freshest and tastiest. "I'm getting ready to start my potatoes. It's one of the best veggies to plant since they keep for a long time!" "it would be helpful if you added a topic on using potato bags - some of us don't have large gardens and would appreciate this information. Thank you!" "We have some tips on growing in potato sacks in our video ‘Planting tips for a better potato harvest’. "